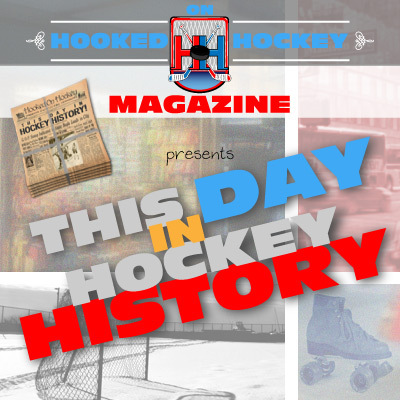 Today in hockey history, the NHL records its first goal! The first two NHL games were played, and also, two young goalies record impressive (and vastly different) feats, a legendary coach sets a record, Gretzky hits a milestone, an interesting goal-scoring record is set, and one of the most significant trades of all time takes place. December 19, 1917 – The NHL history books received its first ink, as the first two NHL games were played! Obviously, scoring the first NHL goal is a huge honor, and that accolade went to Montreal Wanderers defenseman Dave Ritchie, and it took him just one minute of NHL history to score! He scored again in the third in what was actually one of the highest-scoring games in history, as the Wanderers beat the Toronto Arenas 10-9, though there were only 500 fans at that historic game. The other Montreal team, the most historic NHL franchise, played its first NHL game, beating the Ottawa Senators 7-4. And Joe Malone scored five goals for the Habs, meaning the first five-goal game came in the first day of NHL play! So that’s a total of 30 goals in two games. Yeah, defense was still in the works at that point. December 19, 1943 – Harry Lumley became the youngest goaltender to play an NHL game, as he was in net for a Red Wings 6-2 loss against the Rangers. Lumley was just 17 years and 38 days old. It was the start of a pretty solid career, as he ended up finished just a notch above .500 (330-329-142). December 19, 1969 – Speaking of young goalies, rookie goaltender Tony Esposito recorded his fifth shutout of the season in the Black Hawks 4-0 win over the Oakland Seals. He would go on to finish the season with 15 of those S-words, a rookie record, and also a career best; his next best SO total was 10 (1973-74). December 19, 1984 – Scotty Bowman coached the Sabres to a 6-3 win over the Blackhawks to record his 691th victory, the most in history at that point. Since then, that record has been eclipsed by Scotty Bowman’s 1,248 wins (1248-574-314-10). And as you probably already know, Bowman holds the records for most Cups won by a coach with nine. December 19, 1984 – In a 7-3 Oilers win over the Kings, Wayne Gretzky scored two goals and four assists (six points) to reach the 1,000-point milestone, breaking the record for the fastest player to reach that mark…by nearly 300 games. He reached 1k in just his 424th game, breaking Guy Lafleur’s record of 720 games. Yeah, that’s 2.36 points per game his entire career. Stupid. December 19, 1987 – Boston’s Ken Linseman scored late in the third to put the Bruins within one against St. Louis, and Blues Doug Gilmour scored…two seconds later. Yeah, the Bruins pulled the goalie after making it 6-5, and Gilmour shot immediately off the following faceoff, right into the empty net. I feel like someone should have stopped that from happening. Obviously, it was an NHL record for the fastest two goals by anyone. December 19, 1995 – One of the biggest trades (at least in retrospect) took place: The Flames traded star Joe Nieuwendyk to the Dallas Stars for Corey Millen and… the rights to 1995 first-round draft pick Jarome Iginla. Nieuwendyk had already established himself in the NHL, playing nine seasons with the Flames and averaging about a point per game up to that point (including back-to-back 51-goal seasons). He entered a contract dispute with Calgary and got traded for the 11th overall pick in the draft, Iginla. Nieuwendyk had a successful career with Dallas, winning a Cup in 1999, and Iginla went on to be the greatest Flame of all time (though he never won a Cup there).